After 10 years of living in my home, my wooden stairs started becoming squeaky. At this point, I immediately went to the Internet to determine the best way to fix my wooden stairs that were making a squeaking noise. What I wanted was an effective fix that did not leave behind too many nail marks. So, after successfully making my repair, I thought it would be great if I shared what I learned with everyone else! Why Does the Squeaking Begin in the First Place? You should begin by understanding that all wooden stairs will begin to squeak with age. The reason for this is that age causes stairs to become loose, which leads to the wooden treads rubbing on the stringer and risers. Other reasons for the squeakiness is just being walked on constantly, as well as seasonal expansions and contractions in the wood. 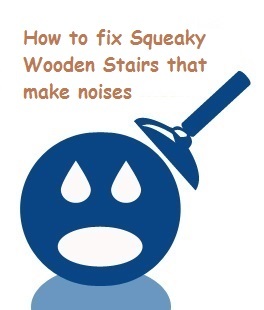 The amount of squeaking you hear will greatly depend if your stairs are constructed from simply nails and screws, or if they were made using glue as well. The majority of the time, a repair like this should not take you too long. The main focus of a fix such as this is usually tightening the boards. The type of fix you choose to do is up to you, but it will largely depend on whether you have access to the underneath of the stairs or not. If you have access to the bottom of the stairs, you can simply locate the loose stairs and tighten them by installing brackets or wood-fastening blocks. This fix is not only quick, but it is also invisible as it cannot be seen from the top. Nonetheless, if you don’t have access to the bottom of the stairs, you will have to do the tightening from the top. When it comes time to actually complete the repair, the first thing you need to do is determine where the squeak is coming from; as in what stair and what area of the stair is making the noise. The purpose of knowing such information is that if it squeaks near the front of it, the issue is fixed by simply reattaching the tread to the riser where they meet. Alternatively, if your stair squeaks on one side or in the middle, then you will more than likely need to pay attention to the stringers. Most commonly you should find three stringers: At least one down the middle and one on each side; there can be more depending on the width of the stair. 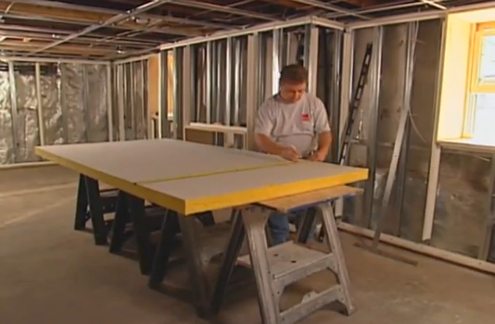 Each stringer is generally anywhere from one to two-inches thick. It should be rather easy to see where they are, as you can usually just locate the existing fasteners. Once you locate the stringers, take a good look at them and determine which one is in need of a repair. After you do this, you’ll want to have someone stand on top of the stair with their feet on either sides of the stringer to help compress them together. While the helper is doing this, you will need to drill a couple starter holes that are just smaller than the nail’s diameter. The best nails for a project such as this are usually 8- or 10-penny finish. Once you have everything lined up, go ahead and drive the nail in. The nail should be driven in just slightly below the tread’s surface. To cover the nail and holes, simply use wood putty. One important tip to remember is that any nail that is driven straight in will work loose over time as it’s constantly moved and bounced around. 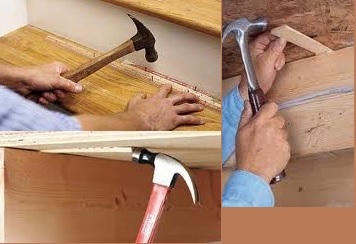 When you use a 45-degree angle, the nail will create a natural clamp to secure the stair in place. In the end, all stairs will become loose overtime, regardless how they are constructed. The good news is that when your wooden stairs begin squeaking, the issue is not that difficult to repair. The important things are that you properly locate the loose stairs, use the correct tools and seek professional assistance if needed. If you follow these simple steps, you will be well on your way to once again having silent wooden stairs! « Samsung Stainless Steel French Door Refrigerator – Model RF4287HARS 28 Cu. Ft.